As specialists in street sweeping, industrial & construction sweeping, and cleanup, Mid-State provides excellent services with sensitivity to environmental issues. We use the most advanced equipment designed for cleaning streets, parking lots, roadways, and industrial sites. We offer full municipal services for municipalities, government agencies, and commercial, industrial, construction, and private individuals. We perform all types of sweeping; from driveways, parking lots, and streets to heavy-duty construction sweeping. 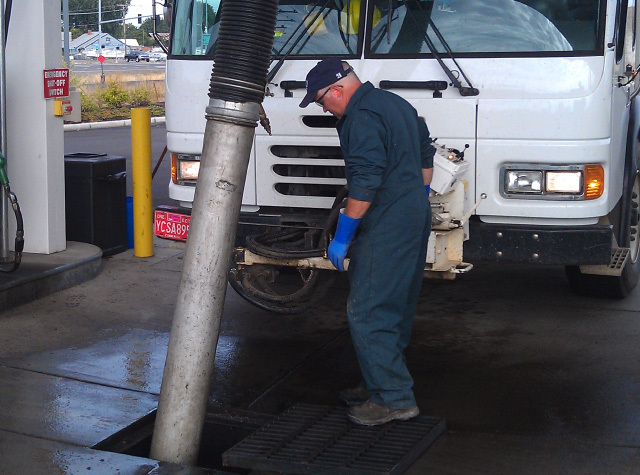 We also do catch basin and drain line cleaning, vacuum excavation, and industrial vacuuming. We have small and large sweepers that are matched to specific jobs to provide the best results for our customers. In general, Air Sweepers are used for parking lots because they are more economical and better at lifting and collecting dust and debris. Industrial and construction jobs are usually completed using a Broom Sweeper for heavier-duty sweeping. We can sweep indoors, outdoors, and even collect unique debris like leftover colored cornstarch from Color Run events. A vacuum truck is a tank truck with a heavy-duty vacuum designed to use air pressure to collect solids, liquids, mud, and sludge through a suction line. They can handle wet and dry materials and are used in hard to reach places such as tanks, furnaces, and bioswales. The vacuum trucks are primarily used by municipal, government, and commercial entities. Vacuum Excavators are more specialized. They are perfect for working in utility locations, around tree roots, or other tight quarters. Mid-State Industrial Service was one of the first twenty Certified Sweeping companies in the US. To become certified, companies must pass strict criteria set by the North American Power Sweeping Association (NAPSA). NAPSA has a formalized process for certifying sweeping businesses that includes an application requiring businesses to adhere to strict guidelines related to safety, experience, continuing education, maintenance, training, and a professional code of ethics. 1-800-SWEEPER is a nationwide service network of independently owned power sweeping companies that have come together to create a competitive advantage for its member companies and the customers they serve. The alliance provides access to sweeping businesses that are committed to quality and ethical standards and ensures clients are matched only with qualified companies for their job. We are a proud member of 1-800-SWEEPER. One of the worst contaminants and dangers to environmental quality is the careless introduction of dust and pollutants to our water and air sources. To help fight this problem, state and federal environmental regulations are becoming more stringent with the goal of reducing or eliminating contamination. Many commercial building and development companies are now required to provide airborne dust control for their jobs sites to help reduce airborne contamination in and around homes, roadways, and other spaces. High concentrations of particulate matter can have health consequences so it is imperative that these materials are collected and disposed of properly. We provide services to clean up spills and remove dirt that has been inadvertently moved onto roadways. We can perform regularly scheduled vacuum cleaning or wet sweeping to control this issue or provide emergency or one-time cleanups depending on your needs. In addition, we can help you come up with a plan to minimize the amount of construction dirt that is tracked onto paved roadways. In addition to airborne dust control, using a regularly scheduled maintenance plan that focuses on street sweeping, wet sweeping, scrubbing, and catch basin cleaning can help mitigate contamination of water sources like rivers, lakes, and streams. Doing this is recommended by the EPA as a Best Management Practice. We are committed to helping our customers meet local, state, and federal compliance for environmental pollutants. Our TYMCO Air Sweepers keep fine particles of dust from washing into the stormwater system. The most difficult standard for commercial sweeping clients to meet is the allowable amount of Zinc and Copper. The TYMCO Air Sweeper does the best job of capturing these fine particles. A little sweeping can go a long way towards preventing runoff and pollution. Based in Oregon, our company appreciates a clean and thriving natural environment.